March organizers said leaders need to "act now" and to reform "unfair" legislation. Demonstrators in Washington, D.C., are marching in support of disaster-stricken Puerto Rico. Thousands attended the Unity March for Puerto Rico to stand in solidarity against laws that organizers say "have been systematically oppressive and crippling to the people of Puerto Rico and the socio-economic growth and sustainability of the island." 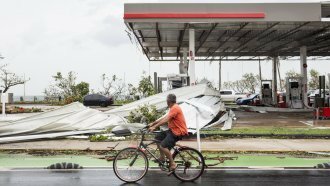 Roughly two months after Hurricane Maria made landfall there, Puerto Rico is still struggling to recover. Many on the island have unreliable power or no power at all. And Ricardo Ramos, the former head of the Puerto Rico Electric Power Authority, just resigned, potentially complicating the issue further. Demonstrators specifically called for the repeal of The Jones Act of 1920, which says goods shipped between U.S. ports must be carried on U.S. ships. The act's critics say it's bad for Puerto Rico's economy. And while Puerto Rico was burdened with massive debt and poor infrastructure before Maria, the storm made the situation worse. Now, marchers are asking that all $73 billion of the island's debt be erased and that the island be rebuilt to above pre-Maria standards.